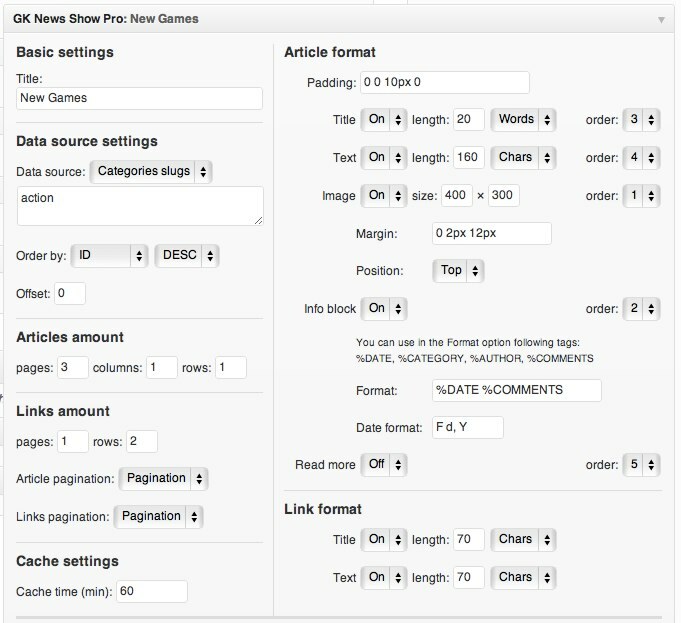 GK News Show Pro is a complex and powerful widget used for displaying posts with thumbnails and additional content like title, text and additional information. 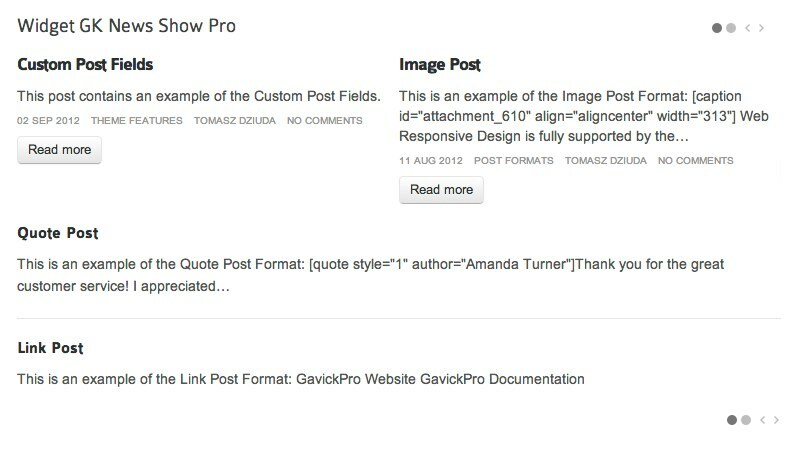 Offset – sometimes it is necessary to display the second post from a specific category – then this option should be set to 1. The default value for this option is 0 – then, the widget will display posts starting from the first post. This option can be used only for the “Latest posts” and “Categories slugs”. The widget can display specific amount of articles and links under the articles. It is possible to specify the amount of pages, columns and rows used to display in the articles amount and links amount options. The cache time option is very important – it specifies how often the widget content is generated – it is safe to set it for at least 30-60 minutes or even more if the page isn’t often updated. When the articles or links are displayed on more than one page, then the pagination will be displayed – the type of the pagination can be specified in the Article pagination and Links pagination options. Both for Articles and Links, you can specify the format of elements displayed. Every element can be disabled by the “On/Off” switchers. For articles and links, a user can specify the maximal length of the title and text. %DATE – the post date – format of the date can be specified in the “Date format” option.